If you are completely new to the TOEFL, the Test of English as a Foreign Language, you may not even know exactly what it is or if you need to take it. The TOEFL is typically used as a college entrance exam for non-native speakers, but it isn't the only one that can be used. Some universities will take the IELTS while some will not ask for you to take an entrance exam at all. For this reason, it is imperative that you find out if the schools that you are interested in require the TOEFL and what score, if any, is their minimum score for acceptance into their program. Start with the end in mind by knowing exactly what score you need from the very beginning. Start off on the right foot by staying organized. Search for the admission standards, often listed on the Frequently Asked Questions tab,for each school that you are interested in and then keep all that information in one easy-to-find place. Download your free University Application Preparation graphic organizer. Print it out and keep it by your desk or use the editable fields to keep a digital copy. After you confirm that you definitely need to take the TOEFL, find out exactly where you are starting from by taking a full-length practice exam. Do not study for this exam; just take it based on whatever you know right now. Make sure that you are replicating the exam conditions as closely as you can. This means, if at all possible, you should take the exam on a computer screen (instead of on paper) and you should absolutely follow the timing limitations and the structure of the exam. You may want to consider using the TPO for this practice exam or a placement exam given to you by a language school. This will give you the most accurate understanding of where you are starting from. If you simply guess what you think you would score or you take the sections at a leisurely pace or on different days, you might not have a realistic understanding of your starting place and therefore you might be setting the wrong goals. Once you have your score, it is time to interpret your score. Just looking at the final number will not necessarily be useful. Instead, you need to identify what you need to know in order to see some significant improvements. The first way to categorize skills that you need is to figure out what you need to know that is specific to the exam and what English skills you need to develop. Exam specific information might mean getting yourself familiar with the structure, patterns, and scoring of the exam. It might mean getting more comfortable with reading on screens rather than on paper and with typing on a QWERTY keyboard. Having this background information means that on test day, you can skip reading the directions, saving you a little time, you can tailor your answers to exactly what the test graders are looking for, and your typing abilities won't hinder your progress on your essay. For each section (Reading, Writing, Listening, Speaking), you will want to look at not only your total score for each section but how you faired on each type of question within the section. For example, there are 10 main types of reading questions. Did you get all the vocabulary questions right but missed all of the sentence restatement questions, for example? A practice book might tell you what type of question was being asked, but if it doesn't, look at the stem of the question in order to classify it. 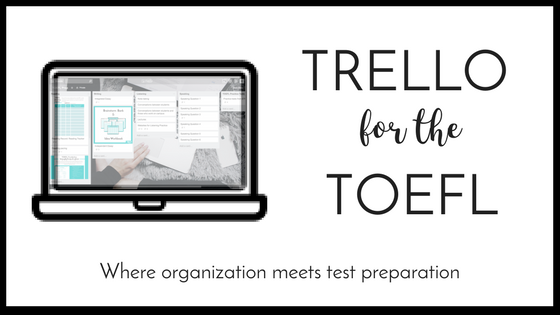 Inside Trello for the TOEFL, you will find graphic organizers to help you keep track of exactly what types of questions you are getting right and wrong. Once you have done this, focus your attention on the patterns of questions that you missed. Don't just think about the question on a surface level; ask yourself what are the skills that are needed to answer this question? For example, vocabulary questions test your understanding of context clues while sentence restatements test your knowledge of paraphrasing. The skills that are being tested are the same ones that you need in order to succeed on the exam, so it is well worth your time and energy to improve upon them. Additionally, by looking at the skills instead of just the type of TOEFL question, you open up many more possibilities in terms of practice material. As you begin to think about the skills you need to improve on, keep your focus on that word need. There is a big difference between need to know and want to know and this is something that I've seen too many students make mistakes with in the past. While wanting to know everything is often the sign of a highly motivated student, you can easily get overwhelmed by the amount of information or you can get distracted learning things that will not result in an increase in points. Remember, by staying focused on learning what you need, you can improve your overall English ability while still seeing sustainable and measurable progress. Your starting score. Make sure to take a practice test so you actually know where you are. You might be pleasantly surprised by how well you do or it may help you keep your growth in perspective. Your goal score. Don't just pick 120. Look at the scores for your goal program before just selecting a number. Look back at what you researched in step 1 of the plan. Time til test. If you only have 2 weeks until your test, you need to triage the situation and consider what you personally need to work on. If you know what you have great listening skills and a short time to prepare, focus on your weaknesses. Also, don't try to learn 150 vocab words every day until the test. Nothing will stick if you overwhelm yourself. Time to dedicate to test prep. Be realistic. If you have a full-time job, school, or children to take care of, you know that it will be difficult for you to keep up with your goal of studying for 4 hours each day. By selecting a reasonable goal, such as I will read and answer one set of questions every day, you will ultimately be more successful. Remember, you can always add more if you find time. For those procrastinators, keep yourself accountable by setting a recurring event on your calendar on your Smartphone or through Google. If you are doing something else, this will motivate you to stop the other activity and complete the required studying. Make it easier by keeping all of your study materials readily available. Don't force yourself to go looking for your book every time. Instead, know exactly what you will do that day with careful planning ahead of time. When making your study plan, remember to account for all the time you need to learn, practice, and review. Don't forget about the importance of reviewing material. Reviewing your answers means doing more than simply checking to see if something was right or wrong. Get into the habit of looking back at tricky questions to see what it was that made it challenging for you. Just because you got it right that time doesn't mean that you necessarily have that skill mastered. Reviewing is also essential when it comes to vocabulary. I have seen students try to learn 40 or 50 words per day, and sometimes they will learn it enough in order to pass a vocabulary quiz. But for most students, if I were to ask them the definitions of those same words the next week, they wouldn't recall them at all. Remember, we are interested in learning for the long term. If you are going to invest time into learning new terms, make sure that you keep going back over them so you can use them on the test and later in your university program. Build in time on your study schedule for review. For instance, you shouldn't schedule yourself to learn new words every single day of the week or schedule exactly 22 minutes to do a reading section and check to see how many answers you got right in that section. Creating your realistic and individualized study plan is essential. Need even more pointers? Check out the blog post on the most common mistakes students make when creating their plans. Make learning, practicing, and reviewing part of your regular routine by utilizing technology instead of letting it distract you. Time tracker, calendar, reminder, and motivation apps and plugins could be incredibly valuable for keeping you on track. Get the Technology for the TOEFL Round Up here. While you don't need to use all (you don't even have to use any!) of these suggestions, you may find that by utilizing technology rather than avoiding technology, you are better able to meet your test-taking goals. Because every student is motivated by unique factors and has different styles, some of these tools may speak to you more than others. Use what works for you and leave behind what doesn't. Your ultimate goal is to put in place systems that use your time most efficiently so you keep to the study plan you've made and can get to your goal score. Here are the essentials-- the structure of the exam and some tips-- for each of the 4 sections of the exam. The Reading section of the TOEFL is made up of 3 or 4 academic articles followed by roughly 12 questions about the passage. If you have 4 reading passages, one will be part of the experimental section that ETS uses to test out new material and it will not affect your score, though you will not know which passage is the experiment. All passages on the TOEFL are non-fiction passages that look like excerpts from college textbooks. The subjects range, covering everything from agriculture to music, but you are not expected to know any outside information in order to succeed. The questions that follow each passage follow 10 distinct patterns, so make sure you practice each type and know which ones are your strengths and which ones are your weaknesses. For each passage and set of questions, ETS gives you 20 minutes. At the end of 20 minutes, the test does not automatically move you to the next section. It is therefore important that you manage your time on your own knowing that the expectation is 20 minutes a piece. In other words, if you have 3 passages with corresponding questions, you will be given 60 minutes that you must divide. Many students spend entirely too much time on the first set of questions, potentially costing them easy points on the last passage and question set. What can you do to improve your Reading Section score? Follow these suggestions to increase your comprehension and ultimately your score. Use the title to identify important terms. Pay attention when these words or their synonyms (words that mean the same thing) are used. Practice taking notes on a different piece of paper. Although homework or in class practice may often be printed, you should practice abstaining from writing on the actual text. On the day of the real test, the reading passage will appear on the computer screen, so you will not be able to write on the actual passage. By taking your notes on a different piece of paper when you practice, you are simulating the test. We want practice to be as realistic as possible so you are prepared the day of the exam. Read the full introduction paragraph, then the last question (it will always be a summary or an organizing into charts question), then the topic sentences of each paragraph. Afterward, go back and skim the remaining sentences in order to save some time. Outline as you read (not after-- outlining after wastes time). This will help you answer detail, summary, negative detail, organizing information into charts, and inference questions. Also, make sure you practice outlining by completing an outline every time you have reading homework. Look for patterns in your outline. Words that are repeated in your outline will likely help you answer questions. What do the important terms or examples in a paragraph have in common? What makes them different from the paragraph that came before? This may help you sort answers into the right section for category questions. It is not important to understand everything you read. As long as you understand the gist--the most important points-- you can answer the majority of the questions. Don't feel the need to answer all of the questions in order. You should go through all of the questions and answer the ones you feel comfortable with first. If you see that sentence 6 is an inference question and you tend to get those wrong, skip it and write a 6 on the top of your notes so you remember to go back and answer it. Answer every question within the 20 minutes, and know that it is okay to guess. You should always eliminate (cross out) any wrong answers first because this will increase your chance at getting the answer right. Keep track of the types of questions you are getting wrong on your score tracker. The writing section of the TOEFL is made up of two short essay questions. There are no multiple choice grammar questions that you must answer, but strong grammar knowledge is important for getting top scores on your essays. Like the Speaking section, the Writing section has both independent and integrated questions. Though many students feel that the integrated essay is more difficult, both the independent and integrated essays are given the same amount of weight when ETS, the creators of the test, score the Writing section. Each essay is given a score of 0-5, averaged, and then put on a scale to produce a final score out of 30 points. You will always see the essay questions in the same order. For the integrated essay, you will begin by reading a short passage (about 250-300 words) in 3 minutes. At the end of that time, the reading passage will disappear from the screen, and you will hear a professor speak about a similar topic for roughly two and a half minutes. Typically the reading passage and the professor will disagree about the topic. When the professor is done speaking, the reading passage returns and a question appears asking you to summarize the main points from the reading and the lecture, showing the relationship between the two. Most commonly, ETS asks you to show how "the lecture casts doubt on the points made in the reading." You have 20 minutes to respond to the essay prompt. For the independent essay, you will write about your opinions on a familiar topic which requires no outside knowledge. You will have 30 minutes to brainstorm and write your essay. (Remember, the writing that you do on the TOEFL iBT is all technically typing). WHAT CAN YOU DO TO IMPROVE YOUR writing SECTION SCORE right away? Free write about topics that are frequently asked about on the independent essay so you have thought of examples far in advance. This will also help you locate words that you will likely need synonyms for. The Listening Section of the TOEFL will take between 60 minutes and 90 minutes depending on the length of the audio and the number of questions each test-taker must answer. Just like in the Reading Section, ETS might give test-takers experimental questions that are used to make future TOEFL tests, making the test longer but not affecting the test-takers score. There are several types of audio recordings students will find in the Listening Section. Conversations are always featured in this section, with dialogues typically taking place between two students, a student and a professor, or a student and another campus employee. Lectures where the professor does all the talking. These are probably the hardest audio recordings for most students. They can be on any topic, and students will hear only one speaker for the entire length of the lecture, which runs for several minutes. Lectures with student interaction. These lectures, too, can be on a wide variety of academic topics. However, they can be much easier to follow if you use the question and answer format as a guide. Listening to interviews could help you prepare for this type of lecture. A seminar style class. It is possible that you will encounter an audio recording where students are doing the vast majority of the talking in a seminar style, with student conversation driven audio recording. Though it is rare, you will hear a number of student speakers with the professor simply guiding the conversation. Remember, you will need your listening skills in other sections of the TOEFL due to the integrated format of the TOEFL iBT. This means that you will need to draw upon your listening skills in the Speaking and Writing Sections, making listening a very important ability to master on this test. WHAT CAN YOU DO TO IMPROVE YOUR Listening SECTION SCORE quickly? The Speaking Section of the TOEFL is made up of 6 questions and takes 20 minutes. Many students find this to be one of the most nerve-wracking sections of the exam because they don't feel confident in their speaking abilities or they feel uncomfortable speaking into the microphone. The good news is that the Speaking Section is one of the easiest to prepare for because the 6 questions follow the same exact pattern in the same order every time. Question 1 is an independent question on a familiar topic. It asks you an entirely open-ended question. Voice your opinion and talk about your own experience. Questions here might be about your best friend, a favorite teacher, or a place you would like to visit. Question 2 is also an independent question on a familiar topic, but it is actually a little easier than question 1 because you are given choices to pick from. This will help you save time when you are deciding what you are going to say during your preparation time. Question 3 is the first of the integrated questions. You will read a short passage about a campus event and then you will hear one or two people discuss their opinion on the topic. You must summarize what the speaker says. Question 4 follows the same structure as Question 3, but it is on an academic topic. The short reading passage will look like a paragraph from a college textbook. After reading this, you will hear a professor explain the concept further, often using specific examples. You will be asked to summarize this. Question 5 is also an integrated question, but you will not have a reading passage. Instead, you will hear two people having a conversation. One person will have a problem while the other makes several suggestions on how to solve the problem. You must summarize what you've heard and then make your own recommendation. Question 6 is typically the question students struggle the most with. You will listen to a professor give a short lecture on an academic topic. The professor usually breaks the topic down into 2 or 3 categories or examples. You will then summarize what the professor said. WHAT CAN YOU DO TO IMPROVE YOUR speaking SCORE soon?